The Cressy Company, or New South Wales and Van Diemen's Land Establishment, was a private partnership of seven members, formed in London in 1825. It was initiated by Bartholomew Thomas, whose brother was the Colonial Treasurer of Van Diemen's Land. 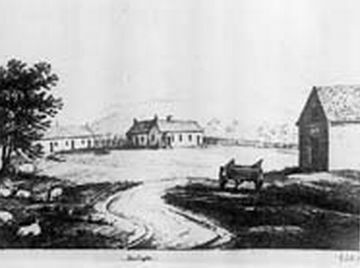 Encouraged to think they would receive large land grants in Van Diemen's Land and New South Wales and exclusive rights to supply both governments with horses, the Company hastily organised an impressive expedition which contained Cleveland and Flemish horses, Shorthorn and Hereford cattle, Merino, Leicester and Southdown sheep and 'necessary implements'. They engaged 'scientific farmers', grooms and shepherds, chartered a ship, and arrived in Hobart in 1826. More than half their animals had died on the voyage. The Company failed to secure a grant in New South Wales, and after some delay settled on a 20,000-acre grant in the Cressy district. By 1833 the Company was on the brink of bankruptcy, but a new manager, James Toosey, saved them, taking the wool clip to England, bringing back more Merino and Southdown sheep and Hereford cattle, and taking advantage of new markets across Bass Strait. One of the scientific farmers, Henry Widdowson, returned to England and in 1829 published The Present State of Van Diemen's Land. With the Victorian gold rush creating buoyant markets, in 1855 the partners decided to divide the property into 52 farms and sell them by auction. Toosey bought Cressy House and the Richmond Hill estate and continued his role as a gifted stud master. The Company's stock went to all parts of Australia, and their Southdowns comprised the country's foundation stud. Their descendants can be traced in today's flock books. Further reading: I Heazlewood, 'The livestock of the New South Wales and Van Diemen's Land Establishment (the Cressy Company)', THRAPP 49/2, 2000.